IKEA of Denmark is now starting a new concept at their Danish stores. 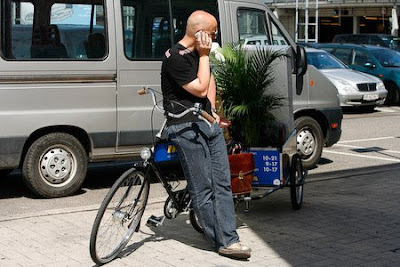 They did a bit of market research and found that roughly 25% of their customers rode their bikes to the stores or took public transport - even though most of then are located outside the cities in large commerical centres - some call them Big Box Districts - which are located outside the city centre. In Copenhagen we have two IKEAs. One is about 10 km from the city centre, the other is about 20 km. I, myself, have made the former trip several times on my 3-speed, carrying all manner of cumbersome goods home to the nest. 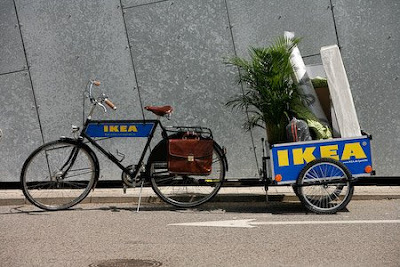 It's great to learn that so many other IKEA customers ride their bikes out there, too. Doesn't surprise me, really, that so many Danes ride to such lengths for such purposes. But it is cool that IKEA respects the fact by launching a concept that celebrates the fact. And remember kids! Cyclists make better shoppers than motorists! 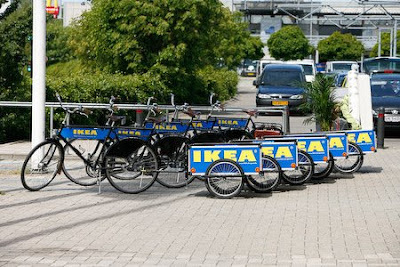 IKEA has invested in Velorbis bikes, at a couple of their stores, that will pull trailers so that customers can ride home with the new purchases. Inexpensive Swedish design pulled home on bespoke Danish design. I like that. 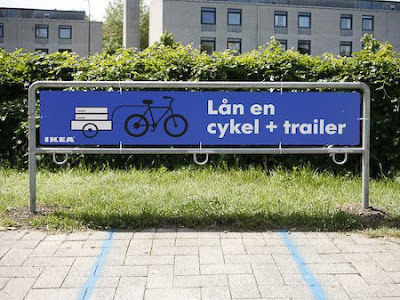 The sign reads "Loan a bicycle & trailer". Simple enough message, really. I assume there will be a deposit, but loan means just that. Not rent. They'll test drive the concept and, if all goes well, they'll implement across the nation and then to other cycle friendly countries. Whenever Wifealiciousness and I buy something too big for normal bike transport, we hire a van - IKEA collaborates with a transport company located in their stores - or take a taxi. It's always irritating to us that we can't get home on the bikes or the bus with large items. Even though we don't have that much IKEA in our home, there are certain things we buy. This is a system we will use and we're looking forward to it.